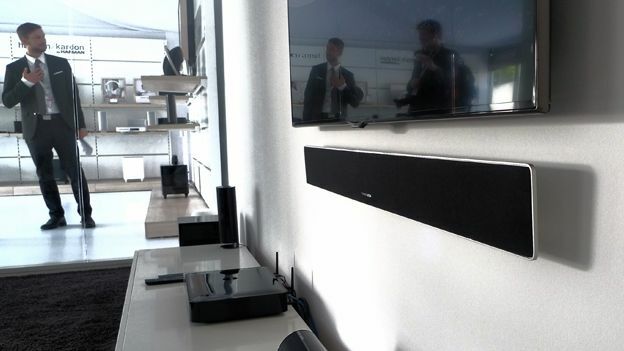 Harman Kardon has just unveiled what it believes is the world's thinnest Soundbar in the form of their new Sabre SB 35 Soundbar which comes in at just 1.25-inches thick. The Sabre SB 35 is built using an ultra-thin aluminium frame with completely custom-built components inside the SB 35 features 8 independent channels using 1.75-inch drivers and 1-inch tweeters to create a completely balanced sound. To help increase the sound it also comes with Harman's Wave surround sound technology which using digital signal processing to deliver an artificial surround sound experience despite originating from one location. Keeping the bass in check is a super-compact wireless subwoofer that puts out 100W and can be installed vertically, horizontally or can even be wall-mounted. With an intelligent IR receiver the Sabre SB 35 can recognise your TV remote whilst the Harman Kardon Remote App available for iPhone and Android means you can ditch the TV remote altogether. The Sabre SB 35 will be available from November with a rough price of around £840.